This article is about the marine organisms. For other uses, see Plankton (disambiguation). Plankton are the diverse collection of organisms that live in large bodies of water and are unable to swim against a current. The individual organisms constituting plankton are called plankters. They provide a crucial source of food to many large aquatic organisms, such as fish and whales. The hydrosphere is the combined mass of water found on, under, and above the surface of a planet, minor planet or natural satellite. Although the Earth's hydrosphere has been around for longer than 4 billion years, it continues to change in size. This is caused by seafloor spreading and continental drift, which rearranges the land and ocean. Though many planktonic species are microscopic in size, plankton includes organisms over a wide range of sizes, including large organisms such as jellyfish. Technically the term does not include organisms on the surface of the water, which are called pleuston —or those that swim actively in the water, which are called nekton . The microscopic scale is the scale of objects and events smaller than those that can easily be seen by the naked eye, requiring a lens or microscope to see them clearly. In physics, the microscopic scale is sometimes regarded as the scale between the macroscopic scale and the quantum scale. Microscopic units and measurements are used to classify and describe very small objects. One common microscopic length scale unit is the micrometre, which is one millionth of a metre. Jellyfish or sea jellies are the informal common names given to the medusa-phase of certain gelatinous members of the subphylum Medusozoa, a major part of the phylum Cnidaria. Jellyfish are mainly free-swimming marine animals with umbrella-shaped bells and trailing tentacles, although a few are not mobile, being anchored to the seabed by stalks. The bell can pulsate to provide propulsion and highly efficient locomotion. The tentacles are armed with stinging cells and may be used to capture prey and defend against predators. Jellyfish have a complex life cycle; the medusa is normally the sexual phase, the planula larva can disperse widely and is followed by a sedentary polyp phase. The name plankton is derived from the Greek adjective πλαγκτός (planktos), meaning errant , and by extension, wanderer or drifter,  and was coined by Victor Hensen in 1887. While some forms are capable of independent movement and can swim hundreds of meters vertically in a single day (a behavior called diel vertical migration), their horizontal position is primarily determined by the surrounding water movement, and plankton typically flow with ocean currents. This is in contrast to nekton organisms, such as fish, squid and marine mammals, which can swim against the ambient flow and control their position in the environment. Christian Andreas Victor Hensen was a German zoologist (planktology). He coined the term plankton and laid the foundation for biological oceanography. Diel vertical migration (DVM), also known as diurnal vertical migration, is a pattern of movement used by some organisms, such as copepods, living in the ocean and in lakes. The migration occurs when organisms move up to the epipelagic zone at night and return to the mesopelagic zone of the oceans or to the hypolimnion zone of lakes during the day. The word diel comes from the Latin dies day, and means a 24-hour period. In terms of biomass, it is the greatest migration in the world. It is not restricted to any one taxa as examples are known from crustaceans (copepods), molluscs (squid), and ray-finned fishes (trout). Various stimuli are responsible for this phenomenon, the most prominent being response to changes in light intensity, though evidence suggests that biological clocks are an underlying stimulus as well. The phenomenon may arise for a number of reasons, though it is most typically to access food and avoid predators. While this mass migration is generally nocturnal, with the animals ascending from the depths at nightfall and descending at sunrise, the timing can be altered in response to the different cues and stimuli that trigger it. Some unusual events impact vertical migration: DVM is absent during the midnight sun in Arctic regions and vertical migration can occur suddenly during a solar eclipse. Holoplankton are organisms that are planktic for their entire life cycle. 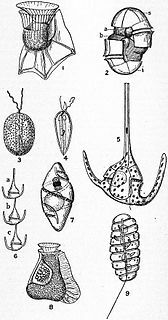 Examples of holoplankton include some diatoms, radiolarians, some dinoflagellates, foraminifera, amphipods, krill, copepods, and salps, as well as some gastropod mollusk species. Holoplankton dwell in the pelagic zone as opposed to the benthic zone. Holoplankton include both phytoplankton and zooplankton and vary in size. The most common plankton are protists. In biology, a biological life cycle is a series of changes in form that an organism undergoes, returning to the starting state. "The concept is closely related to those of the life history, development and ontogeny, but differs from them in stressing renewal." Transitions of form may involve growth, asexual reproduction, or sexual reproduction. Copepods are a group of small crustaceans found in nearly every freshwater and saltwater habitat. Some species are planktonic, some are benthic, and some continental species may live in limnoterrestrial habitats and other wet terrestrial places, such as swamps, under leaf fall in wet forests, bogs, springs, ephemeral ponds, and puddles, damp moss, or water-filled recesses (phytotelmata) of plants such as bromeliads and pitcher plants. Many live underground in marine and freshwater caves, sinkholes, or stream beds. Copepods are sometimes used as biodiversity indicators. Species distribution is the manner in which a biological taxon is spatially arranged. The geographic limits of a particular taxon's distribution is its range, often represented as shaded areas on a map. Patterns of distribution change depending the scale at which they are viewed, from the arrangement of individuals within a small family unit, to patterns within a population, or the distribution of the entire species as a whole (range). Species distribution is not to be confused with dispersal, which is the movement of individuals away from their region of origin or from a population center of high density. A water column is a conceptual column of water from the surface of a sea, river or lake to the bottom sediment. Descriptively, the deep sea water column is divided into five parts—pelagic zones —from the surface to below the floor, as follows: epipelagic, from the surface to 200 meters below the surface; mesopelagic, from 200 to 1000 meters below the surface; bathypelagic, from 1000 to 4000 meters below the surface; abyssopelagic, from 4000 meters below the surface to the level sea floor; hadopelagic, depressions and crevices below the level sea floor. Phytoplankton (from Greek phyton, or plant), autotrophic prokaryotic or eukaryotic algae that live near the water surface where there is sufficient light to support photosynthesis. Among the more important groups are the diatoms, cyanobacteria, dinoflagellates and coccolithophores. Zooplankton (from Greek zoon, or animal), small protozoans or metazoans (e.g. crustaceans and other animals) that feed on other plankton. Some of the eggs and larvae of larger nektonic animals, such as fish, crustaceans, and annelids, are included here. Bacterioplankton , bacteria and archaea, which play an important role in remineralising organic material down the water column (note that prokaryotic phytoplankton are also bacterioplankton). However, some of these terms may be used with very different boundaries, especially on the larger end. The existence and importance of nano- and even smaller plankton was only discovered during the 1980s, but they are thought to make up the largest proportion of all plankton in number and diversity. Plankton inhabit oceans, seas, lakes, ponds. Local abundance varies horizontally, vertically and seasonally. The primary cause of this variability is the availability of light. All plankton ecosystems are driven by the input of solar energy (but see chemosynthesis), confining primary production to surface waters, and to geographical regions and seasons having abundant light. A secondary variable is nutrient availability. Although large areas of the tropical and sub-tropical oceans have abundant light, they experience relatively low primary production because they offer limited nutrients such as nitrate, phosphate and silicate. This results from large-scale ocean circulation and water column stratification. In such regions, primary production usually occurs at greater depth, although at a reduced level (because of reduced light). Despite significant macronutrient concentrations, some ocean regions are unproductive (so-called HNLC regions). The micronutrient iron is deficient in these regions, and adding it can lead to the formation of phytoplankton blooms. Iron primarily reaches the ocean through the deposition of dust on the sea surface. Paradoxically, oceanic areas adjacent to unproductive, arid land thus typically have abundant phytoplankton (e.g., the eastern Atlantic Ocean, where trade winds bring dust from the Sahara Desert in north Africa). While plankton are most abundant in surface waters, they live throughout the water column. At depths where no primary production occurs, zooplankton and bacterioplankton instead consume organic material sinking from more productive surface waters above. This flux of sinking material, so-called marine snow, can be especially high following the termination of spring blooms. The growth of phytoplankton populations is dependent on light levels and nutrient availability. The chief factor limiting growth varies from region to region in the world's oceans. On a broad scale, growth of phytoplankton in the oligotrophic tropical and subtropical gyres is generally limited by nutrient supply, while light often limits phytoplankton growth in subarctic gyres. Environmental variability at multiple scales influences the nutrient and light available for phytoplankton, and as these organisms form the base of the marine food web, this variability in phytoplankton growth influences higher trophic levels. For example, at interannual scales phytoplankton levels temporarily plummet during El Niño periods, influencing populations of zooplankton, fishes, sea birds, and marine mammals. The effects of anthropogenic warming on the global population of phytoplankton is an area of active research. Changes in the vertical stratification of the water column, the rate of temperature-dependent biological reactions, and the atmospheric supply of nutrients are expected to have important impacts on future phytoplankton productivity. Additionally, changes in the mortality of phytoplankton due to rates of zooplankton grazing may be significant. Freshly hatched fish larvae are also plankton for a few days, as long as it takes before they can swim against currents. An amphipod: an exoskeletoned animal with curved body, with two long and two short antennae. Zooplankton are the initial prey item for almost all fish larvae as they switch from their yolk sacs to external feeding. Fish rely on the density and distribution of zooplankton to match that of new larvae, which can otherwise starve. Natural factors (e.g., current variations) and man-made factors (e.g. river dams) can strongly affect zooplankton, which can in turn strongly affect larval survival, and therefore breeding success. The importance of both phytoplankton and zooplankton is also well-recognized in extensive and semi-intensive pond fish farming. Plankton population based pond management strategies for fish rearing have been practised by traditional fish farmers for decades, illustrating the importance of plankton even in man-made environments. Phytoplankton are the autotrophic (self-feeding) components of the plankton community and a key part of oceans, seas and freshwater basin ecosystems. The name comes from the Greek words φυτόν (phyton), meaning "plant", and πλαγκτός (planktos), meaning "wanderer" or "drifter". 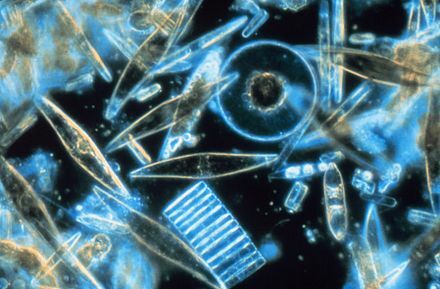 Most phytoplankton are too small to be individually seen with the unaided eye. However, when present in high enough numbers, some varieties may be noticeable as colored patches on the water surface due to the presence of chlorophyll within their cells and accessory pigments in some species. Meroplankton is a wide variety of planktonic organisms, which spend a portion of their lives in the benthic region of the ocean. These organisms do not remain as plankton permanently, rather, they are planktonic components in transition, which eventually become larger organisms. After a period of time in the plankton, meroplankton either graduate to the nekton or adopt a benthic lifestyle on the seafloor. Meroplankton consists of larval stages of organisms such as sea urchins, starfish, and crustaceans. Success of meroplankton populations depends on many factors, such as adult fecundity, fertilization success, growth and larval stage duration, behaviour, dispersal, and settlement. Mortality depends on many factors, such as predation, competition, disease, parasites, and physiological stresses. Survival and mortality of meroplankton has a direct effect on adult population numbers of many species. Many of the common, well-known animals found on the Great Barrier Reef spend time as free-swimming meroplankton, bearing little or no resemblance to the adult they will become. The differences between the appearance of larval and adult stages led to much confusion in the past when larval forms were often believed to be completely different species from the adults. Larvae spend varying amounts of time in the plankton, from minutes to over a year. However, just how long these tiny animals can be considered truly planktonic is under some debate. A pycnocline is the cline or layer where the density gradient is greatest within a body of water. An ocean current is generated by the forces such as breaking waves, temperature and salinity differences, wind, Coriolis effect, and tides caused by the gravitational pull of the Moon and the Sun. In addition, the physical properties in a pycnocline driven by density gradients also affect the flows and vertical profiles in the ocean. These changes can be connected to the transport of heat, salt, and nutrients through the ocean, and the pycnocline diffusion controls upwelling. High-nutrient, low-chlorophyll (HNLC) regions are regions of the ocean where the abundance of phytoplankton is low and fairly constant despite the availability of macronutrients. Phytoplankton rely on a suite of nutrients for cellular function. Macronutrients are generally available in higher quantities in surface ocean waters, and are the typical components of common garden fertilizers. Micronutrients are generally available in lower quantities and include trace metals. Macronutrients are typically available in millimolar concentrations, while micronutrients are generally available in micro- to nanomolar concentrations. In general, nitrogen tends to be a limiting ocean nutrient, but in HNLC regions it is never significantly depleted. Instead, these regions tend to be limited by low concentrations of metabolizable iron. Iron is a critical phytoplankton micronutrient necessary for enzyme catalysis and electron transport. The microbial food web refers to the combined trophic interactions among microbes in aquatic environments. These microbes include viruses, bacteria, algae, heterotrophic protists. Dinoflagellates are eukaryotic plankton, existing in marine and freshwater environments. Previously, dinoflagellates had been grouped into two categories, phagotrophs and phototrophs. 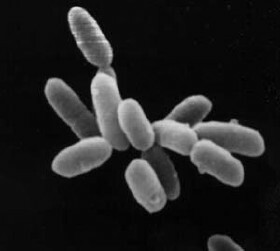 Mixotrophs, however include a combination of phagotrophy and phototrophy. Mixotrophic dinoflagellates are a sub-type of planktonic dinoflagellates and are part of the phylum Dinoflagellata. They are flagellated eukaryotes that combine photoautotrophy when light is available, and heterotrophy via phagocytosis. Dinoflagellates are one of the most diverse and numerous species of phytoplankton, second to diatoms. Bacterioplankton counting is the estimation of the abundance of bacterioplankton in a specific body of water, which is useful information to marine microbiologists. Various counting methodologies have been developed over the years to determine the number present in the water being observed. Methods used for counting bacterioplankton include epifluorescence microscopy, flow cytometry, measures of productivity through frequency of dividing cells (FDC), thymine incorporation, and leucine incorporation. ↑ "plankter". American Heritage Dictionary. Houghton Mifflin Harcourt Publishing Company. Retrieved 9 November 2018. ↑ John Dolan (November 2012). "Microzooplankton: the microscopic (micro) animals (zoo) of the plankton" (PDF). ↑ Thurman, H.V. (1997). Introductory Oceanography. New Jersey, USA: Prentice Hall College. ISBN 978-0-13-262072-7. ↑ Hensen, V. 1887. Uber die Bestimmung des Planktons oder des im Meere treibenden Materials an Pflanzen und Thieren. V. Bericht der Commission zur Wissenschaftlichen Untersuchung der Deutschen Meere, Jahrgang 12-16, p. 1-108, . ↑ Karleskint, George; Turner, Richard; Small, James (2013). "Chapter 17: The Open Sea". Introduction to Marine Biology (4th ed.). Brooks/Cole. ISBN 978-1-133-36446-7. ↑ Agrawai, Anju; Gopnal, Krishna (2013). Biomonitoring of Water and Waste Water. Springer India 2013. p. 34. ISBN 978-8-132-20864-8 . Retrieved April 2, 2018. ↑ "plankter - marine biology". Encyclopædia Britannica. ↑ Emiliani, C. (1991). "Planktic/Planktonic, Nektic/Nektonic, Benthic/Benthonic". Journal of Paleontology. 65 (2): 329. JSTOR 1305769. ↑ Wang, G., Wang, X., Liu, X., & Li, Q. (2012). "Diversity and biogeochemical function of planktonic fungi in the ocean". In: C. Raghukumar (ed. 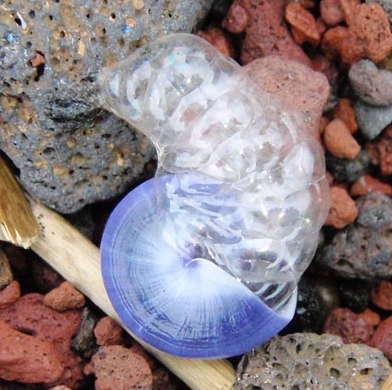 ), Biology of Marine Fungi. Springer Berlin Heidelberg, p. 71-88, . ↑ Hartmann, M.; Grob, C.; Tarran, G.A. ; Martin, A.P. ; Burkill, P.H. ; Scanlan, D.J. ; Zubkov, M.V. (2012). "Mixotrophic basis of Atlantic oligotrophic ecosystems". Proc. Natl. Acad. Sci. USA. 109 (15): 5756–5760. Bibcode:2012PNAS..109.5756H. doi:10.1073/pnas.1118179109. PMC 3326507 . PMID 22451938 . Retrieved 28 April 2017. ↑ Ward, B.A. ; Follows, M.J. (2016). "Marine mixotrophy increases trophic transfer efficiency, mean organism size, and vertical carbon flux". Proc. Natl. Acad. Sci. USA. 113 (11): 2958–2963. Bibcode:2016PNAS..113.2958W. doi:10.1073/pnas.1517118113. PMC 4801304 . PMID 26831076 . Retrieved 28 April 2017. ↑ Omori, M.; Ikeda, T. (1992). Methods in Marine Zooplankton Ecology. Malabar, USA: Krieger Publishing Company. ISBN 978-0-89464-653-9. ↑ Dusenbery, David B. (2009). Living at micro scale: the unexpected physics of being small. Cambridge: Harvard University Press. ISBN 978-0-674-03116-6. ↑ Martin, J.H. ; Fitzwater, S.E. (1988). "Iron-deficiency limits phytoplankton growth in the Northeast Pacific Subarctic". Nature. 331 (6154): 341–343. Bibcode:1988Natur.331..341M. doi:10.1038/331341a0. ↑ Boyd, P.W. ; et al. (2000). "A mesoscale phytoplankton bloom in the polar Southern Ocean stimulated by fertilization". Nature. 407 (6805 http://tass.ru/en/non-political/745635): 695–702. doi:10.1038/35037500. PMID 11048709. ↑ Sarmento, H.; Montoya, JM. ; Vázquez-Domínguez, E.; Vaqué, D.; Gasol, JM. (2010). "Warming effects on marine microbial food web processes: how far can we go when it comes to predictions?". Philosophical Transactions of the Royal Society B: Biological Sciences. 365 (1549): 2137–2149. doi:10.1098/rstb.2010.0045. PMC 2880134 . PMID 20513721. ↑ Vázquez-Domínguez, E.; Vaqué, D.; Gasol, JM. (2007). "Ocean warming enhances respiration and carbon demand of coastal microbial plankton". Global Change Biology. 13 (7): 1327–1334. Bibcode:2007GCBio..13.1327V. doi:10.1111/j.1365-2486.2007.01377.x. hdl:10261/15731. ↑ Vázquez-Domínguez, E.; Vaqué, D.; Gasol, JM. (2012). "Temperature effects on the heterotrophic bacteria, heterotrophic nanoflagellates, and microbial top predators of NW Mediterranean". Aquatic Microbial Ecology. 67 (2): 107–121. doi:10.3354/ame01583. ↑ Mazuecos, E.; Arístegui, J.; Vázquez-Domínguez, E.; Ortega-Retuerta, E.; Gasol, JM. ; Reche, I. (2012). "Temperature control of microbial respiration and growth efficiency in the mesopelagic zone of the South Atlantic and Indian Oceans". Deep Sea Research Part I: Oceanographic Research Papers. 95 (2): 131–138. doi:10.3354/ame01583. ↑ Chisholm, S.W. ; et al. (2001). "Dis-crediting ocean fertilization". Science. 294 (5541): 309–310. doi:10.1126/science.1065349. PMID 11598285. ↑ Aumont, O.; Bopp, L. (2006). "Globalizing results from ocean in situ iron fertilization studies". Global Biogeochemical Cycles. 20 (2): GB2017. Bibcode:2006GBioC..20.2017A. doi:10.1029/2005GB002591. 1 2 Roach, John (June 7, 2004). "Source of Half Earth's Oxygen Gets Little Credit". National Geographic News. Retrieved 2016-04-04. ↑ Tappan, Helen (April 1968). "Primary production, isotopes, extinctions and the atmosphere". Palaeogeography, Palaeoclimatology, Palaeoecology. 4 (3): 187–210. Bibcode:1968PPP.....4..187T. doi:10.1016/0031-0182(68)90047-3 . Retrieved 2016-04-04. ↑ Steinacher, M., et al. (2010). "Projected 21st century decrease in marine productivity: a multi-model analysis". Biogeosciences, 7, 979-1005. Kirby, Richard R. (2010). Ocean Drifters: A Secret World Beneath the Waves. Studio Cactus Ltd, UK. ISBN 978-1-904239-10-9. Dusenbery, David B. (2009). Living at Micro Scale: The Unexpected Physics of Being Small. Harvard University Press, Cambridge, Massachusetts ISBN 978-0-674-03116-6. Kiørboe, Thomas (2008). A Mechanistic Approach to Plankton Ecology. Princeton University Press, Princeton, N.J. ISBN 978-0-691-13422-2. Dolan, J.R., Agatha, S., Coats, D.W., Montagnes, D.J.S., Stocker, D.K., eds. (2013).Biology and Ecology of Tintinnid Ciliates: Models for Marine Plankton. Wiley-Blackwell, Oxford, UK ISBN 978-0-470-67151-1. Look up plankton in Wiktionary, the free dictionary. Wikimedia Commons has media related to Plankton . Wikisource has the text of the 1911 Encyclopædia Britannica article Plankton .